China has long been known as a heavy polluter as a result of its rapid industrialization in recent decades, but now it is by far the world’s leading solar energy superpower with some truly impressive honors, including the world’s largest solar farm. The Longyangxia Dam Solar Park in China’s northwestern Qinghai province is officially the world’s biggest solar farm, boasting a staggering 4 million solar panels and covering an area of 27 square kilometers (10 square miles). Photos captured by NASA’s Landsat 8 satellite in April 2013 and January 2017, and the ESA’s Sentinel-2 highlight the truly monumental advancements made in just four years. The farm produces 850 megawatts of clean energy, enough to power 200,000 Chinese households, reports the South China Morning Post (or 140,000 US homes according to Scientific American). By the end of 2016, China had a total installed capacity of 77.4GW, reports The South China Morning Post (SCMP), but even so, solar energy accounted for just one percent of China’s total energy production with ‘King Coal’ still reigning supreme in the Chinese energy mix. “The low cost of building photovoltaic modules (solar panels) in China is the country’s main advantage. Many modules in the US and Europe are made in China,” Yang Hongxing, a renewable energy professor at the Hong Kong Polytechnic University told the SCMP. However, as impressive as the megastructure may be, a key obstacle is impeding widespread solar energy deployment: critically underdeveloped infrastructure to both deliver and store the energy produced. “Some of these solar energy plants have to shut [for some time each year] because there is no use for such energy in those regions,” Hongxing added. However, with Tesla and Panasonic teaming up to provide low-cost energy storage solutions via their Gigafactories, this particular challenge may soon be a thing of thing of the past. China invested $103 billion in renewable energy in 2015, the last year for which figures are available, and set a record for the most solar capacity installed in one year in human history, according to Greenpeace. To put that figure into perspective, China added the equivalent area of one-and-a-half soccer pitches for every hour of 2015. Early indications are that China somehow managed to double that figure in 2016. 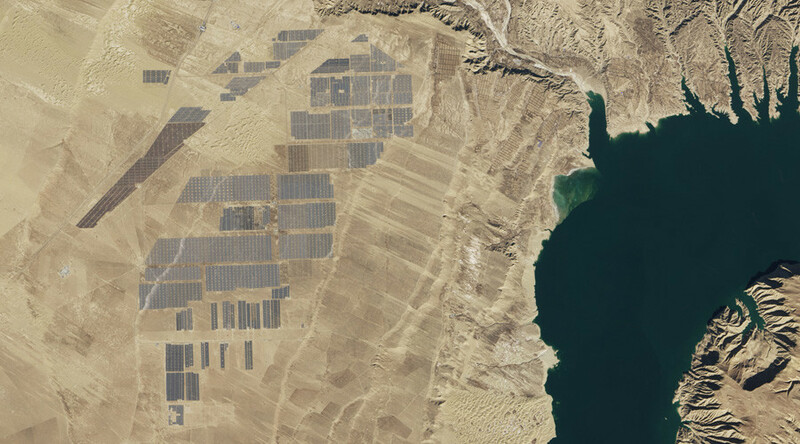 As if that wasn’t enough, a new solar champion is waiting in the wings in the Ningxia region of Northern China. The pretender to the solar throne will ultimately boast a 2 Gigawatt capacity generated by 6 million solar panels, costing upwards of $2 billion.